The Iranian pilots of F-14s hold the record of shoting down three aircraft with one missile. 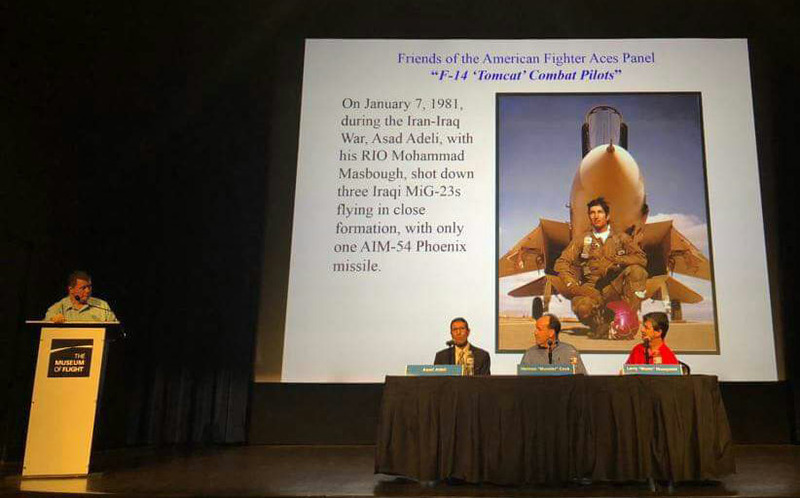 On January 7th 1981, an Iranian F-14 Tomcat piloted by Asadullah Adeli and Mohammad Masbough shot down three Iraqi MiG-23 aircraft with one AIM-54 Phoenix air-to-air missile. This exploit, enabled by the Phoenix’s explosive charge (designed to destroy a bomber), was verified by the Iranian army, which found the wreckage of the three MiGs near the oil terminal. Masbough: Ground said they didn’t see anything and told me to enter the zone until they’d see them. First I thought it was one plane. When we got near, I realised it was 3 aircraft flying very close to each other. Adeli: So we started accelerating toward them and getting close to their flight path. So if we have to fire a missile we need to be as close as possible to their flight path. And finally the radar station replied: We don’t have anything in the area, if you have them, just shoot them down. Masbough: As soon as we found they were a flight of 3, our plane’s priority system chose the plane ahead as number one. Naturally the middle on was 2 and the one in the rear was 3. Adeli: We continued towards the range that was an optimal range for the missile to be fired. We were above 20000ft and they were flying really low even though it was night, they were probably at around 2000ft. Masbough: I told Adeli if we were going to shoot, we’d better hit the one in the middle. As they were flying close to each other, the blast might damage the other two as well. As soon the missile detached, the count down started on the screen. When it reached zero, I had nothing on the screen. I didn’t think we’d be able to hit all three of them, but we had. Adeli: By the time our missile hit the target, it was just reaching the Kharg Island. We just saw a splash, and went back to our normal pattern. The next day we found out, they have found parts from 3 different aircraft at the crash site. Next articleSo weird seeing a beast like that a) vertical b) upside down.